Considering she found her inspiration in a childhood bag of Halloween candy, it’s probably not a stretch to call Michelle Merrill’s career a treat. “I was trick-or-treating, I was 7 or 8, and this lady was handing out piano lesson business cards on the candy. I took it home and dumped out all my candy and found this business card and said, ‘Oh, hey, Mom and Dad, can I take piano lessons?’” Merrill recalled with a laugh. The associate conductor of the Detroit Symphony Orchestra, Merrill will make her Oklahoma City Philharmonic debut Saturday as guest conductor for the third concert in the OKC orchestra’s Classics series. Born in Dallas and raised in Canton, Texas, she said several family members will be driving up for the performance. As a woman, Merrill, 34, is aware that she is still a rarity on the podium. “We did a show recently where I was conducting for assisted living residents … and these are people in their 70s, 80s, early 90s and so many of them told me, ‘You’re the first woman conductor I’ve ever seen,’ and I thought, ‘Oh wow,’” said Merrill, who is also the Detroit Symphony Orchestra’s Phillip and Lauren Fisher Community Ambassador. While Marin Alsop, who became the first, and so far only, woman to lead a major American orchestra in 2007, when she started as the Baltimore Symphony Orchestra’s music director, has talked about the sexism she faced when she set out to become a conductor, Merrill said she thankfully did not encounter the same barriers to the baton at Southern Methodist University. 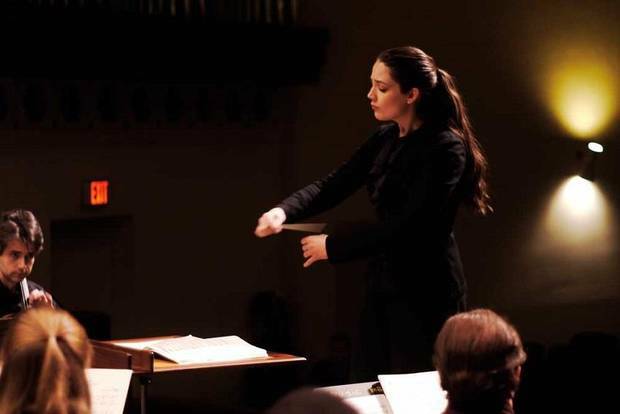 “She was told like ‘women don’t do that’ when she said she wanted to be a conductor. … For me, that was never the case. I was lucky enough to be in an environment growing up and then when I went to SMU in Dallas that nobody said, ‘Oh, women can’t do that,’” said Merrill by phone from her home in Jacksonville, Florida, where her husband, Steve Merrill, is the principal percussionist for Jacksonville Symphony. 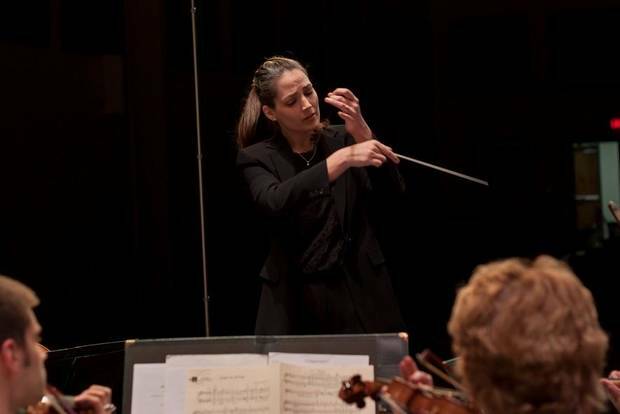 With the Detroit Symphony Orchestra, she helps plan and conduct more than 30 concerts per season, including its renowned educational webcasts, which have reached in excess of 100,000 students to date in classrooms throughout the nation. “My husband went to a concert at one of my first seasons in Detroit when I was doing an education concert … and he said, ‘It was so interesting because you would see the little girls in the audience all conducting along with you.’ He said, ‘Not necessarily the boys, but all the girls were definitely doing it.’ He was like, ‘I think it’s because they saw themselves in you and so they’re thinking, “Oh, I can do that”’ When you hear things like that, you think, ‘That’s great.’ I love that I can be kind of an example for even younger generations that they wouldn’t even think twice about it being a male or female on the podium,” she said. Merrill won’t be the only one making her OKC Philharmonic debut Saturday. The concert’s soloist, flutist Yossi Arnheim, also will be performing with the orchestra for the first time. In a collaboration between the OKC Philharmonic and the Oklahoma Israel Exchange, the concert will feature Arnheim and three other players from the Israel Philharmonic Orchestra. “It’s always kind of a delicate balance of programming … and when we settled on this I was really, really happy. I think it’s going to be a nice full course menu for the audience,” she said. “This concert represents a great balance of the familiar and new, and it is all really enjoyable music. ‘Appalachian Spring’ is regarded by many as the greatest American work of the last century, and it is one of my own personal favorites. And we are thrilled to share two of the other works on the program — Reinecke’s flute concerto and the Ligeti ‘Concert Romanesc’ — that may be new to many in the audience, but we know they will be very well received,” said OKC Philharmonic Executive Director Eddie Walker in a statement. Tickets and information: 842-5387 or www.okcphilharmonic.org.